THE XTREME ANTI-ESTROGEN SUPPORT AND HARDENING AGENT! ESTRABOLIC is one of the most popular Bodybuilding Ingredients in the community at the moment. It has been the essential product used in countless cycles as well as PCTs. What makes ESTRABOLIC truly stand out from the crowd is the fact that it’s the most powerful Aromatase Inhibitor on the market today, which means that it can effectively lower estrogen levels and is in that sense comparable to much stronger compounds that aren’t available in the US. The main ingredient in ESTRABOLIC permanently binds to the receptors on the aromatase enzyme, rendering the enzyme completely useless. WHAT IS AROMATASE? Aromatase is an enzyme in your body that converts testosterone into a form of estrogen called estradiol. Aromatase is a naturally occurring enzyme in your body, and aromatization (the process of turning excess testosterone into estrogen) is a natural process because men actually need BOTH Testosterone AND Estrogen to live a healthy life. In an ideal situation, you would have naturally HIGH levels of Testosterone and LOW levels of Estrogen. Thus your body would only convert a little bit of that Testosterone into Estrogen so that your body would be well-balanced. HOWEVER and UNFORTUNATELY this is NOT the norm and very often NOT the case! In today’s society we are being exposed to more and more foods, materials and a variety of other things that contribute to men’s Testosterone levels plummeting and Estrogen rising to new heights. This is becoming a HUGE problem for a lot of men of all ages but especially men over the age of 25! ESTRABOLIC can help STOP this stuff from happening! Taking ESTRABOLIC can help prevent the aromatase enzymes from converting your testosterone into estrogen. This means feeling better, getting stronger, increased libido, and shedding fat! 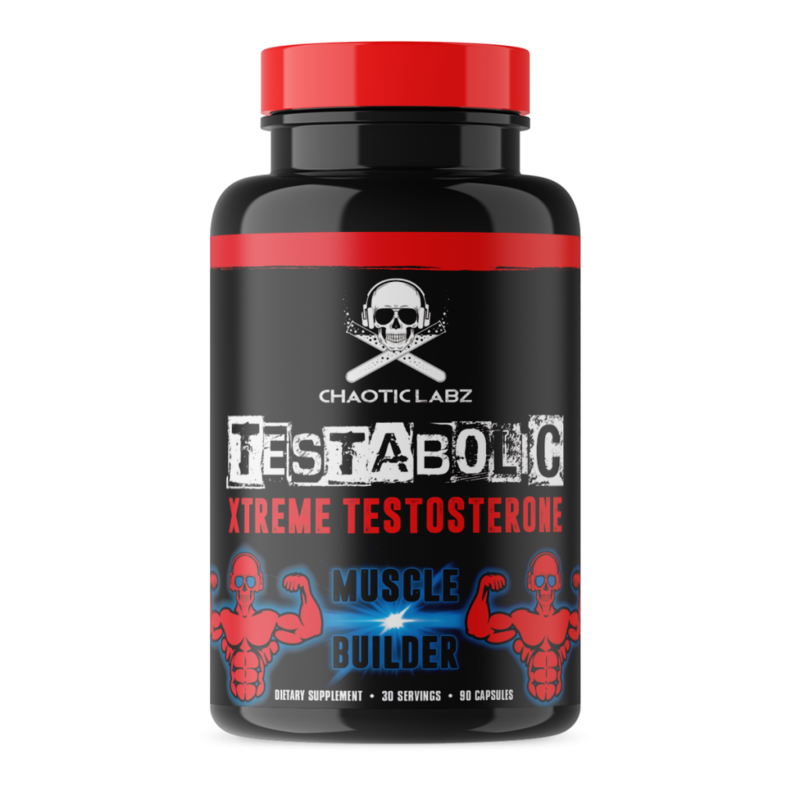 ESTRABOLIC can even help guys under 25 that don’t have a high conversion rate since it inhibits the natural conversion of T to E… guys under 25 will enjoy all the benefits of having Naturally HIGH levels of Testosterone and Naturally low levels of Estrogen. Both age groups will also profit from its ability to lower excessive levels of cortisol. As this is also a HUGE benefit for people who train hard because after intense training sessions your body’s natural cortisol levels will usually spike upwards. Increased levels of cortisol, AKA the stress hormone, can severely limit muscle recovery if you do not take measures to lessen it with proper nutrition, rest, and supplementation. With lower cortisol levels, you can expect to recover much faster from intensive training, helping you to continue to train hard and grow without risk of the ever dreaded OVERTRAINING! TRAINING DAYS: As a dietary supplement take 2 capsules immediately after any athletic training to help lower estrogen levels and increase testosterone. This product is perfect for post cycle therapy (pct), getting cut, and hardening up. For Xtreme results, stack with TESTABOLIC. NON-TRAINING DAYS: Take 2 capsules first thing in the morning. THIS XTREME ANTI-ESTROGEN FORMULA may be used for the following Supplemental Goals: BLOCKING ESTROGEN, GETTING HARD, GETTING SHREDDED, BUILDING MUSCLE & POST CYCLE THERAPY (PCT). * These statements have not been evaluated by the Food and Drug Administration. This product is not intended to prevent, treat, diagnose, or cure any disease. Helped dry me up fast. I took it as part of my pct and it definitely made a difference. I kept 80-90% of my gains in size and strength and libido was great. I would definitely recommend this to anyone wanting to harden up or squash some estrogen from a puffy cycle. Wish you could get a BOBO discount or something if you bought two bottles.. Because 25 servings put me 5 days short of what I needed (30) but other than that SOLID guys.